Spring is finally showing its face, and that means I get to be outside more. This means I need to dig out my favorite beeswax lip balm recipe. I am prone to chap lips, and my husband’s job keeps him outside all day, so we go through a lot of all-natural lip balm. Our bees keep us supplied in beeswax, but all ingredients including the beeswax are all-natural and fairly easy to find. I bought all these ingredients through Amazon since I pay no shipping with my Amazon Prime Account, but in the past I have found them all in the local all-natural health food store. 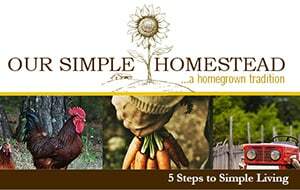 The steps are easy, so please follow along. Step #1 – Gather all of your ingredients and layout your containers on an old towel or old cookie sheet. 1 cup grated beeswax – Beeswax protects the lips from the harmful rays of the sun. 4 tablespoons coconut oil – Coconut oil is known for its moisturizing ability. 3 tablespoons almond oil – Almond oil rejuvenates dead cells. 2 teaspoons vitamin E oil – Vitamin E helps reduce the effects of sun damage and decreases dryness. 2 drops of tree tea oil – Tree tea oil has healing powers and also helps keep bacteria away. 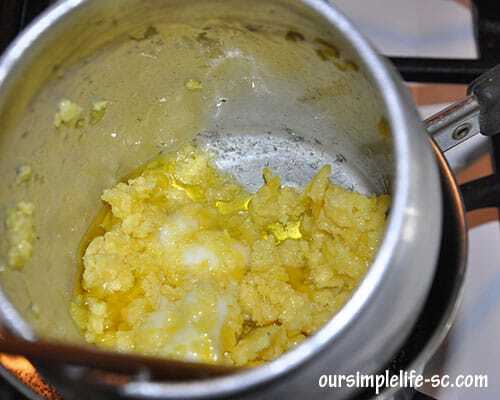 Step #2 – In a double boiler or a bowl set inside a pan that does not sit on the bottom, add your grated beeswax, coconut oil and almond oil. Slowly heat the wax until it is melted. Keep your heat on low so it does not burn the wax. Melt it slowly on a low heat. 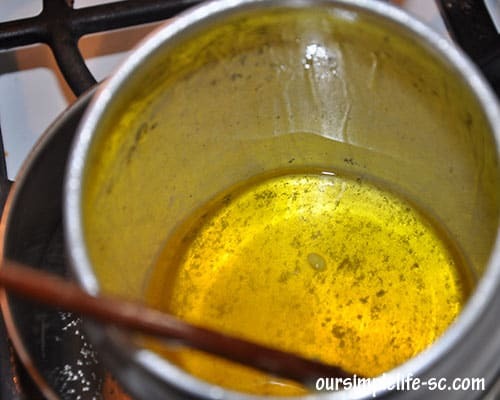 Step #3 – Once the wax is melted, remove from heat and add Vitamin E and Tree Tea Oil while it is still hot. 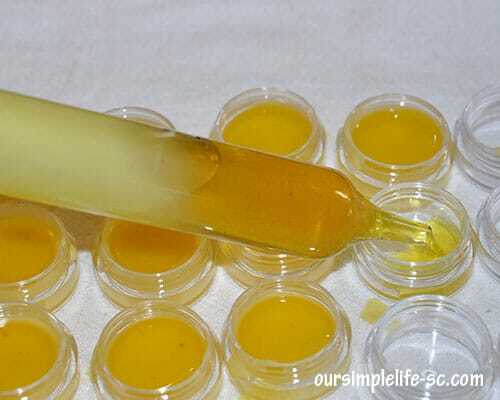 Step #4 – With a clean or new turkey baster fill each container with the melted beeswax lip balm. 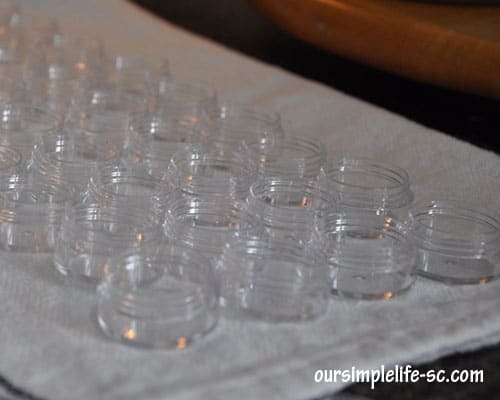 Step #5 – Once the balm is cooled, you can add the lids back on each container. 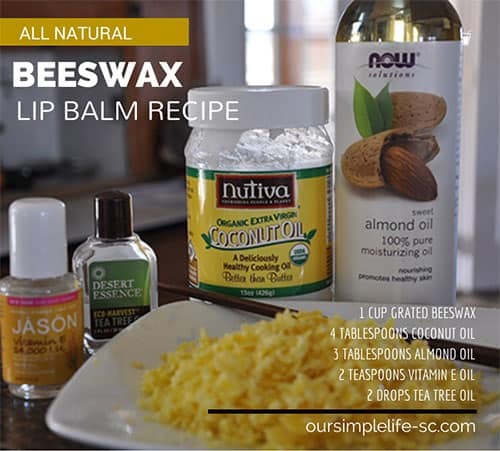 Even though I make this beeswax lip balm recipe for my lips it can be used on other areas of the body. 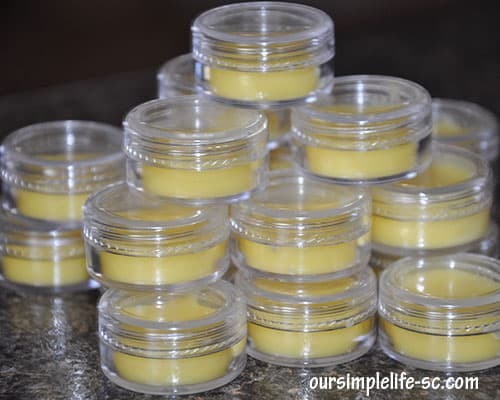 Dry hands, knees, and elbows can all benefit from this recipe of lip balm. Thank you so much for sharing this recipe! I really appreciated how you shared what each ingredient did. I’ll have to try a batch. I know when I was looking for recipes for this lip balm I wanted to know why each ingredient was used, so I thought someone else might appreicate it as well. Thanks for visiting! Sounds like a great recipe for some smooth lips. I made my own lip balm several weeks ago and should have added the almond oil, but wanted to do it cheap with what I already had in the house. The almond oil would have made it a bit smoother. I poured mine into some aluminum candle molds that we had. (I try and avoid plastic.) I later thought that a small glass baby food jar with lid would be perfect. I actually had to make this recipe a couple times to get the right amount of almond and coconut oil. The first batch I made was too hard, but the second one that I added more almond oil was perfect…nice and smooth and creamy. The baby food jar would have been great. I use this recipe on my elbows and heels so the baby food jar would have been perfect for that. I will have to remember that for next time. Thanks for visiting!